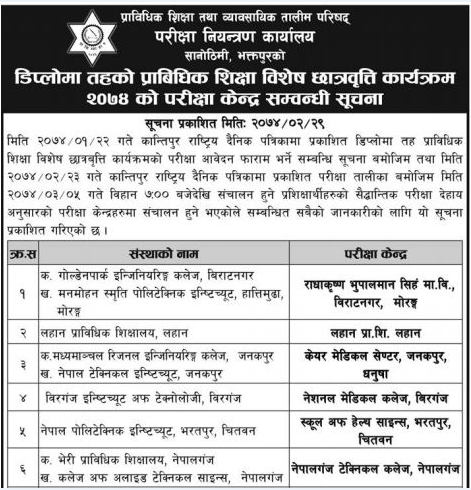 Today, 12 June, 2017 [29 Jestha, 2074], Council for Technical Education and Vocational Training (CTEVT) published the notice regarding examination center of Scholarships programs for Diploma Level. The examination will be held on 19 June, 2017 [5 Aashad, 2074] and the examination starts from 7:00 am onwards. 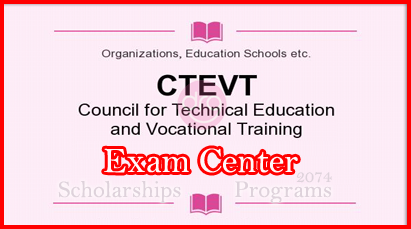 Should you have any queries/questions regarding the CTEVT Scholarships Program's Exam Center for Diploma 2074, then please feel free to CONTACT ME or you may drop your comment in below comment box. 0 Response to "Exam Center For Diploma | Scholarships Programs | CTEVT"